Teemu Keiski demonstrates how to utilize the new TreeView control in ASP.NET 2.0 to display hierarchical data from a database. Now that ASP.NET 2.0 is about to be released to manufacturing, we ASP.NET developers have very interesting times ahead of us. Along with the new Framework, we have a major set of new controls to use and to ease our development work. One of the new controls, also my favorite, is the TreeView control. Microsoft has developed it based on feedback which arose from the release of the TreeView control in the open-source IE Web Controls package, targeted at the previous version of ASP.NET. TreeView has not just been rewritten; it now also includes a major set of new features such as support for client-side populating, on-demand populating, postback events, hyper link navigation, and a lot more. 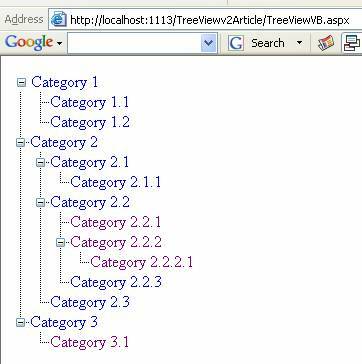 I’m going to provide a simple example how to display hierarchical data from SQL Server database in the TreeView. A requirement is that the implementation should not be dependant on the hierarchy level in the database. It means that the TreeView implementation should be capable of displaying data from any level, no matter how deep. Let’s assume we have TreeViewSampleDB database with the SampleCategories table as follows. Note: It doesn’t matter if you use SQL Server 2005 or a previous version to try this sample. Then, we have TreeViewVB.aspx page with the TreeView control declaration as follows. This means that we are setting the initial expand depth of the TreeView to the first level of nodes. We want to use the client-side node populating feature so that we can provide our users with a better usage experience. Note that this way, no postbacks are involved. We also want to show lines between the nodes and the expand/collapse icon if our tree nodes have child nodes. Next, we start looking at the code in the TreeViewVB.aspx.vb file. We want to populate the root level. Here’s the code. This happens by connecting to the database, querying the first set of nodes (having null as the parent id), and creating TreeNode objects with the PopulateNodes routine, which follows next. Here’s an important piece of logic. The PopulateNodes method iterates through all rows in the DataTable, and if the given node has child nodes, it sets the PopulateOnDemand property of the TreeNode object according to that. This has the effect that the expand/collapse icon is shown if the node has child nodes. Next, we want to create the routine to populate the child nodes of a given node. This happens with the PopulateSubLevel method. Here, the idea is the same as with the root level, but with the distinction that only child nodes of the given node are queried and populated with the PopulateNodes method (described earlier). The trick to triggering the populating of the child nodes is as follows. That is, when the TreeView’s TreeNodePopulate event is raised, PopulateSubLevel is called. TreeNodePopulate is raised for a TreeNode which is expanded by the user for the first time. Due to PopulateNodesFromClient (TreeView) and PopulateOnDemand (TreeNode) settings, this happens with the client-side callback mechanism which is handled by the ASP.NET Page framework. This means that populating does not involve a postback. And, due to better cross-browser support in ASP.NET 2.0, this also works for other browsers such as Firefox. Note that clicking on the node does cause a postback because I haven’t modified the select action of the populated tree nodes from the defaults. With this setup, trying our sample page and expanding the nodes, we should get a view like this. We have set up a working TreeView relatively easily. This approach requires a little bit of code, but shows that it’s not really because of the TreeView control but due to the nature of hierarchical data. Certainly, there’s room for creating a hierarchical data source control to deal with this so that data access wouldn’t require that much code; however, I believe that getting your hands in code is the best way to learn about the technology. how change the query in your sample? Great work and I see that it is still helping people after 6 years. I'm using VS2012-C# and had to make one adjustment to your code to avoid the error [The name 'TreeView1' does not exist in the current context.] I see others have gotten this at times too, and it is difficult for new users to troublehsoot. I had to enclose the content[not the using statments] of the code behind page in a namespace where the namespace was the project name. Then it all worked. Thanks, this really helped me a lot. Have been looking for a way to do 3 level menus for a while, as I had found some code that could do 2 levels, but wasn't easily adaptable for 3 levels. Was able to adapt this to suit a horizontal menu as well as horizontally arranged treeviews. With this code and data, I can see that I can do as many levels in my menus/treeviews as I like, based around the parent id settings for each option. Working like a charm. Thanks heaps. my treeview is not in a master page...can any body tell why and code example too.. I had to convert your code to C#, but that was easy except for two problems I had. One is C# doesn't have the CInt data type. I spent a good hour searching MSDN for CInt in C# but all the articles were in VB so I guess C# doesn't have one. Once I concluded that, I just type casted it to an Int32. In another one, I had to use the C# funcion Convert.ToInt32(). The functions work to populate a TreeView with the table you layed out. The only thing I need to do is add a column to mine with the navigateURL string since I'm using the TreeView as my menu for my website. thank you your code very very very help me and i want to thanks of you bundle and bundle thanks because i was confused about this and finally i solve and issue from your code. it's very help full for me. kindly tell me why this happening? can we do the same tree view control in vertical manner??? Use the code download, it has both VB.NET and C#. i am looking for horizantal binary tree. Nice post but I have to develop a MLM project. can you help me. hi, I tried this code.but only root node is coming.I am a beginner only in asp.net and sql server. thanks for this perfect code. On clicking the node it is getting postback and the child nodes are not opening. Title: Oh hey men. Good Job! How to display in Horizontal view? your technic is very practical and useful. I am very happy after getting ur code. This solution works great! but how to make first node in tree as root node problematically. Any one have solution plz reply to this post. Thanks! This is very simple to understand. You're Great! This is the best TreeView from DB code. One of the best articles I have come across so far on implementng hierarchial tree view. Thanks a lot for posting this article. It's very useful for me. This is the best code I've found for displaying hierarchical data from a database. great code , how can we (link to) I mean lets say I want to do like msdn you click on a node in the tree and you see it on the right any help with that ? Your article is very good and is really helpful to me. It would be great if you could tell me how to fetch the ID of the selected node like when we click on any node we can get the ID of that particular node. I have implemented this in user control and I am overriding page render event to move viewstate at the bottom.. This i can do, how about when your database records change and you need to repopulate the TreeView with the changes. I have bind treeview with database in C#.But i want add node to treeview from the front end. Title: TreeView won't expand so please do like this it works for me! Thanks a lot! I managed to modify this example to create multi level acordion menu. Its been very helpfull! Now I am working out how to add/update/remove nodes including manipulating sql server table. I believe it will be workable. Please let me know what changes I need to make to this code if I am connecting to an Oracle Db. I'm using .NET 3.5, and followed this example. I even made a sample table with the same data. However, when I view it in browser, the treeview only shows Category 1, 2 and 3, and will not expand when clicked. Any ideas? This happens even if I set the populateNodEvent to TreeView1_TreeNodePopulate. My treeview is in a master page. Any ideas? Thanks in advance. Excellent work! Thank you so much. Thank you very much,this is a very useful piece of code to populate a treeview. This is very useful article. I must thank you as I was searching for such solution from no. of days. Thanks for this article, I have struck up with last week, due to your solution, I have achived my result. I tried this code. but when query was fired it generates error like "incorrect syntax near id"
Further understanding by reading your article and working with the code has helped me resolve the original issue. So, technically, I'm looking for a way to manually create level one and sub-populate accordingly. Is that impossible? For example: what if you had a table or listing a level ABOVE SampleCategories? That would be my 'First Spouse' and 'Other Spouse' levels. Thanks again. I know this is the code that will ultimately work for me. What an excellent article! I have been trying to 'mod' it a bit to suit my purposes. I want to ACTUALLY display a mother (parent) with all her children on her SPOUSE'S page, and if that man has more than one wife, display all the wives with all their children. Seriously. The problem is for my purposes that the sub proc actually works too (thank you, will use it elsewhere) BUT since I'm working with genealogy, I really don't want all those children-of-children-of-children coming from the database. EVERYONE with a parent has a parentID in my table, so when I do this it actually works (using ID instead of NULL), but then I get all her children, grandchildren, great grandchildren, etc.) Don't want the db doing that much work. Its good but can any budy help me to make Vertical Binary Tree with or with out free Tree Controls. I try Fly Fly Tree View but its not free does any budy have the solution???????????? And thanks to Above Code Writter/ Logic Bulder. Thanks for this code it's help me a lot! Is there a way to have the root expanded when the tree first loads? I've tried everything. Really great work. Thank you very much. Code is very nice, worked well. But if i want to open a another page on clicking child node then how will i check that now there is not another child in that node and what will be code, which can be used with above code. i m using two table. 2nd has field id(same as 1st field),name(submenu) tablename is plans. ("select name,(select count(*) FROM plans where id=product.id) as childnodecount FROM product where ID=@id"
then tn.Value = dr("Id").ToString() error occur when control goes into populatenode again. a error occur when control goes into populatesublevel. this is given below at line. error is Column 'Id' does not belong to table . there is a problem with the sample code. The Errormessage is: "The handles-clause needs a withevents-variable". For those who have the problem of the Node.Parent being null when populating on demand set the PopulateNodesFromClient to false. How can i only the parent nodes? I do not want to show the leaf nodes. I am using this to build a shopping cart, and at the moment, all the items are in the tree view. What i want is to select a product type from the tree view then the actual product in my dropdown list where the user can then add the item to his/her shopping cart. It is very nice article, But I want to give Links to the each nodes. Can u help me? I will be very thankful, If u halp me. nice article, but I am looking for a variation of this. Hi Anitha, Soz for the long wait. What Error is it giving you? Title: What's the problem with the code download? See top of the page "Download Sample Code"
I liked the post.it is really good one .but it will be better if you can give the codes in C#. could you please explain what you want to do? It’s really very good, Thanks a lot for the code .. this is exactly what I wanted. I tried your code. But it takes lot time to show the TreeView. Hi can you give me any example of how to add a node at any leval please? Hi anitha. what you could have is a link or path to a selcted item in the database. You can then add TreeView1.SelectedNode.Value. Then you should use the value that is returned to lookup the column in the database where the path to the specific file is. You can use the following code to get the data. This code is awesome and unique in its kind. Could you pl help in resolving the issue propping up when trying to display a pop up window upon selecting a node. Could you pl help me in figuring out this issue? ontreenodepopulate="TreeView1_TreeNodePopulate" is not needed in VB version since sample code has Handles clause there (it is equivalent), though it is matter of taste how one does wire up events. C# version of the code download has this already. Thanks. This is a great post. Should make a book out of it. I see the link to the sample code has been fixed; thanks. ...and THANKS VERY MUCH for providing a VB version! Proof of a great sample - look at how long ago you wrote this, and yet still so many people are finding it useful! Thanks again! Title: "Download Sample Code" link broken? Hello - is this working for anybody? Though the reply is too late but may be it can of some help to ppl visiting this article now. First time going through your article, building sql database table and implementing the code in C# worked great. Now I have to enable and disable imageurl's based upon access authentication. thanks for providing the basic and best concept on treeview control. Thanks a lot sir. Excellent stuff. really cool. works fine for me. This is excellent code and it works well. However I have been trying to make a WebUserControl of this - I usually load ASCX controls dynamically into an UpdatePanel on demand from a control outside of the UpdatePanel eg: using a choice from a listbox to populate an UpdatePanel (by first clearing it of the existing control and then adding the new control). However I have been unsuccessful in trying to convert the treeview code in this article to an ASCX file that can be dynamically loaded on demand as descibed above - any ideas/examples ? can it be applied for navigation menu whose menu items are soming from database? I am populated the data(3 levels) in treeview with Showcheckboxs property option set to true.I have checked the required fields in treeview.Now i want to read this treeview & insert data to database. I can't see neither child nodes nor plus icon.althogh in my database there are parent nodes (Null parent) and child nodes, but just parent nodes exists without any plus. It's a excellent programming. Thank you very much for helpping. Thanks for the good code. its working .but i have one small doubt " when i select one root node remaining nodes should be hide how can achive that?" i want to show the tree view like what you showned in above, but in the place of category1 2 3 i wnat show them as check boxes if any one selects that below child nodes are selected. Plz tell me how can i make it multicolumn? Dim strRights As String = ""
strRights = strRights & nodes.Value & ","
How can activate ShowCheckBox with treeview and get the value as per checkbox value True. Works like a charm! I can't thank you enough. Hey man i was so much worried, but u made me so relaxed. Thanks a lot.. Title: need 2 disable a few nodes...help!!!!! i guess il need the child node which i wanna disable den put it into a for loop right??? ?........thanx in advance..
First, thank you very much for dharing the code. I applied the code and it works to one exception my last node keep repeating. Here is my code and my SQL works when run outside it just retun one item but I run the example in my page it keeps adding the same node. thanks a lot. the treeview just work nicely. actually it had me write different SQL query to retrieve data from my database. but with just that, i can make good treeview. i still not exploring the depth anyway. which im gonna do now. This code is working fine.But when i click on last node means there no any child node i want to fetch data related to that node value id from database how i will do it. hi ,i have applied the code of tree view in my application but it is not displaying the child nodes when i click on the + (plus sign) it is not at all show the sub node . it is running to Oracle. Name: Mohammad javed Comm-IT India P Ltd. Fantastic. This works great. I needed to use tree view to list reports in datawarehouse by report type and this fits the bill perfectly. Title: Just Wow Grt !!! After weeks of looking for a good, or even close TreeView example. This worked out great for me. Thanks. Thanks! The most useful part was setting ExpandDepth="0" to TreeView, otherwise, very very weird behavior occured.. It worked fine for me. Thanks. But clicking any of the item does not lead to post back. What is the reason? I was able to get the treeview to populate correctly. My goal is to incorporate other data with the treeview. A data entry like form in treeview mode. Any ideas? the c# side of the code works with only little tweaking of a local connection string. I did not change anything else. No instance failure for C# code. Thanks a lot Teemu, I've been struggling with this for 2 days. Both VB.NET and C# code were equally tested when I wrote the article and worked 100% in the scenario I used as basis. If you get such failures, your connection string is wrong, you refer wrong objects with different IDs etc. Remember, it cannot match 100% your setup, at least db connection string must be changed. Hey, Jim thanks for the advertisement! But I'm going with something that is free, thanks. Good example by the way, Teemu! Here is one that has multiple columns. It still has on-demand populating, postback events and hyper links too. Great article. It works for me, which is phase 1. Now I need to incorporate treeview into a gridview data entry form. I had found the perfect article, but PC crashed and I can't find it again. Thanks. how can we display treeview from top- to bottom rather then from left to right. This is a really good example - Im ashamed to say that I didnt even attempt to code it myself before trawling the net for a solution, but with a couple of tweaks to use Generics for the data (as I do) this worked first time! Well done Teemu Keiski on such a well written example! PS. (for earlier poster) there is c# code in the download example.. This code works, but displays ALL of the data on the treeview. But Id like SPECIFIC data to show, depending on who logs into the system.... how do I do that ? I used the code to implement the dynamic treeview and it worked fine. But when i generated the TreenodeCollapsed and TreenodeExpanded event, then on initial page load it works fine but when i clicks to expand a subfolder it calls treenodeCollapsed first before page load. I am trying to do the same thing but with ASP, there is a store procedure that's we have to do something similar that assign item from the "title" column for example a level number. So I'm trying to do the same thing but when I call the function for this store procedure, it's display all my data as parent nodes instead of sorting it in the proper order. Do you have any suggestion of how I can get this to function properly since I am calling a stored procedure, and working with ASP? Hey works for me! Thanks! nice example.i m bigginer pls. can u post same in C# coding. I seriously don't understand why anyone would use VB, when C# is so much better. Such a Nice code that helps me lot. Do you have this type of code for menu control or is it same for menu control? Thank you for posting this - it is extremely helpful! I was wondering how would I be able to extend this further so if I were to add/delete a node in the database via a webform, the parent node of the TreeView would automatically refresh? Nice and simple Snippet. Right usage of Tree View Control. Hope s this gives dare to tree view by programmers. All the Best. Hi all, Greate work!. I got question similiar to the last post. How do I populate another sub under each Category? Say if I have products assiciated with earch category. Hope this making sense. This is very nice work!!! but how do I associate the categories or subcategories with products to make it like real world stuff? For example if I have CategoryID link to Products table as foreing key. Your post solved my problem. Men u are great it simply solved my 1 week head ache. If the TreeView control is not inside an UpdatePanel control, disable callbacks on TreeNode controls that are not part of an asynchronous postback. To do this, set the PopulateOnDemand property to false. Programmatically refresh all controls that register callbacks during the asynchronous postback. For example, you can place the TreeView control inside an UpdatePanel control. The TreeView control does not have to be in the UpdatePanel control where the asynchronous postback originates, as long as the UpdatePanel control that contains the TreeView control is refreshed. You must apply styles by using a reference to a Cascading Style Sheet (CSS) class. For example, instead of setting the NodeStyle property by using a property-subproperty attribute, set the style by using the property-CssClass attribute. Similarly, when you use the NodeStyle template to set the style, use the CssClass attribute of the template. The EnableClientScript property must be true (the default value). In addition, if callbacks are enabled for the TreeView control, you cannot change the EnableClientScript property between asynchronous postbacks. I expand one node, then select some other node (select not expand), by this time TreeNodePopulate and SelectedNodeChanged both will be fired, and then keep clicking on this single node (already selected), TreeNodePopulate envent will be fired again and again which causes sub nodes of first expanded node keep grouping and duplicating. If I remove updatepanel to use regualar postback mode, I don't have this issue. suppose i want to show all c:/ documents..that means c:/ should be the parent one and rest sub-folders should come in chlid like and so on.. I was up and running within 2 minutes. Thanks for the excalant example. simple and easy to follow. As I said, I'm new to Expression Web and ASP (though I know VB6 and VFP, and I already implement Treeview in different way). Now, my problem was when you select another node, the previous node change the color to like disabled (its look like revisited link). Looking forward to any help and link that I could resolve my problem. First of all, thank you so much for the sample code. It help me to save time. I am very new to web thing. Can you please extend your help to me for 2 things that I need to implement. 1. Can the treeview be populated before the page display? Same as the other comment below? 2. In node click event, I need to pass the ID# (not the newid()) so I can open a browser page that contains the information of the node click. inline " PopulateSubLevel(CInt(e.Node.Value), e.Node) "
Above example is working fine. 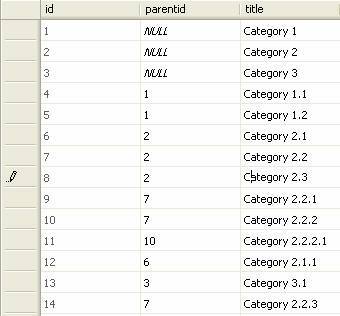 Can you let me know if i want, How to add root node (category 1, category 2, ...) statistically(i.e., not from the database table) along with dynamic (from dataset) parent & child node population? See the "Download Sample Code" on top side of the page. There's both C# and VB.NEt code. Great article. I was up and running within 5 minutes. Thanks for being succinct and supplying the code examples. Title: Anyone get 'Object Expected' error ? This is best implementation of treeview using codes. Well done! simple and efficient. Hey Teemu, Very nice code, It work how exsample in my application very well. If you need reference. 2.1 is title, not parentid. Otherwise, I don't understand what you're referring to. The code sample above contains tested code, which is emphasized on the article examples, and it works just fine with no overflows. but if the parentid is an integer type with the value like 2.1, 2.1.1, 2.1.1.1 it will return 2 to parentid and caused stackoverflow exception, oohohoho so change it to string will solve a problem. As I write in the article: "Note that clicking on the node does cause a postback because I haven’t modified the select action of the populated tree nodes from the defaults. Thankyou for your solution. It is nice and very helpful to me. But I face one problem. When I click on node's text it got postback and load same data once more. Title: On Page Load all the Nodes should be expanded ? Thanks a lot. It helped me lot. Is it possible that at Page Load automatically all the Nodes expanded ? One more bug i found is when I am clicking on Sub Node it is creating whole tree again and again. Title: Perform ALL roundtrips on page load first? Is it possible to alter the code so that the tree is entirley populated before at page load? This way we wouldnt have to invoke OnTreeNodeExpanded="TreeView1_TreeNodePopulate" ?? If this was possible, it would eliminate the annoying postback which I find the only poor thing. Anyone wanna give eliminating the postback a shot? Really this program helped me. I am so oblige to you. Great Article for displaying data! (1)Is there a way to display the childnode data onclick of it's parent? (2) Then I insert all the user's choices in a related table using the following fields. After the user submits there data I give a web page which displays everything they entered. I show a Treeview which displays only the Goals and Objectives they selected, but it lists ALL the objectives for each goal. I would like it to show only the objectives with its master goal. Good piece of code, thanks. I had to add OnTreeNodeExpanded="TreeView1_TreeNodePopulate" to the TreeView to get it run properly. Took me a while to find that bug. ...this helped me a lot! Can you suggest me a way of getting the check boxes which are checked in the treeview using the above sample as reference? This was a great article!! !Thanks a lot! I have a similar requirement and was struggling to get this done!This perfectly works! The menu works perfectly well in IE but not in Firefox/1.5.0.12. Still Your article is really helpful. I was strongeld with the treeview for days! this code is perfect , no other words! you trolly help me out! Hey, thanks for the tutorial, I tried running your code with a stored proc as the sql command argument. In my SQL management studio, I get the correct number of returns. On the tree view, I get exactly 2 sets of them. Where could I have gone astray. I didn't make any other mods except replacing your inline sql with a sproc. Title: Works good - Save State of Tree? Title: Error if the child node is clicked. HI its a good code. I am able to populate the tree but if i click the node one more time null point error is comming. Title: if use image to create organization chart .Is it possible? if use image to create organization chart .Is it possible? Hi Teemu, great code. I wanted to know how can I get the text for the Root and Parent Nodes to Toggle just like the expand(+)/collapse(-) images? it is very nice example of populating a asp.net treeview with hierarchichal data. how can add romove a node and refresh to show new nodes or remove nodes in tree. Great code, up and running in no time. or is there a way to use the DB to assign the url? Set the NavigateUrl property of a TreeNode. It puts the node in navigation mode (when clicked you're redirected to the URL). Title: Link Nodes to a url? This is great, but how do you link the nodes to URL's? There's the source both in VB and C#. If you use a GridView as instantiated control to get grid-like output, there can be certain challenge with state management side. You probably need to create custom TreeView as well to deal with that side. However, just rendering a grid/table with given HtmlTextWriter within TreeNode should be easy task. Is it possible to bind a gridview in treeview? Hi, nice code and well explained. I also have this problem, when I link each SubCategory to an aspx page, the tree closes back to root. Code may be useful ,but i tried to run this code n its not working.The query which u have used is not clear. Hi, nice code and well explained many thanks. I have the same problem as a post earlier but could see a response. Thank you, I try it and its help me. But, if I open page vith TreeView1.visible=false, and on Button.Click I make TreeView.visible-true subcategory dosn't open. Some body know why? with least database trips how can we get this hierarchy? This is excellent, I really like approach. Thanks very much for this simple and precise article that explains the concept to the point. Awesome!! Adnan, you need first think does representing data in TreeView make sense. Basically if you have 3 or 4 tables and it's direct parent-child relationship, idea is eseentially the same as with self-referencing table (and yes, it can make sense). First get the root level, then query for the next and so on. Using separate tables basically makes the levels in the tree fixed, as well as queries getting specific levels. sc is just shortcut to SampleCategories. See the "FROM SampleCategories sc" in where clause. Essentially it's using a subquery to get count of child nodes for a parent node and sc is used to reference the parent table from the subquery. I tried the code and it worked, thanks. I have used basic query strings before, but nothing like this. What does sc.id represent? Also, what is this "sc" between SampleCategories and WHERE for? Let suppose if i have many (3-4) tables in SQL server 2005 linking with each other, and i want to disply all records in treeview what i should i do ? This is a perfect reference for the dynamic treeview population. Thanks for everyone who contributes to this code. Good one!! I m getting an error though "Treeview doesnt exist in the current context". Am I missing any namespace? Also is there a way to have datagrid itself in the child node? However, 'n ' database calls will be made where n is the number of nodes having child element. If 'n' is too big, this application will consume a lot of memory. Cant you retrive the entire structure in one go, save it in xml and manage on client side? please suggest code for this. Brilliant!! Thank you so much for a nicely written and explained solution. After a few changes to field names and database connection strings, it worked with the table I have already populated with data. Thank you very much. I just started with ASP.NET and I've been looking for days for a way to populate the treeview from a DB. The problem was always that the code was way over my head and they didn't explain it very well. More like "Here's the code. Enjoy". You took the time to explain all the steps and I'll be able to use this example with my application. This coding was very useful.